This cake is a match made in heaven for me. 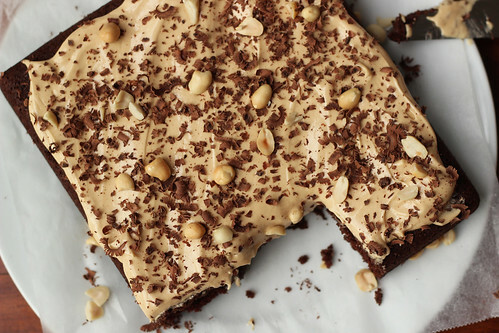 It’s a rich, almost fudge like, cake topped with a light and creamy peanut butter frosting. I knew from the moment the photo loaded onto my screen that it would become one of my new favorite desserts. And I am pretty sure it has. Bonus, the size (an 8×8 pan) was perfect for us. We had an amazing dessert for a few days and no cake was wasted. Spray an 8×8 pan with non stick cooking spray. Add the flour, sugar, cocoa powder, baking soda and salt to the 8×8 pan, whisk together. Make 3 wells in the dry ingredients, 1 large and 2 small. To the large well, add the vegetable oil. To the 2 smaller wells, add the vinegar and vanilla, separately. Pour the water into the pan and use a rubber spatula to stir together until there are no more streaks of flour. Spread the batter evenly in the pan. Bake for 23-25 minutes, or until a toothpick inserted in the center comes out mostly clean, just a few moist crumbs. Set the pan on a wire rack to cool completely. To make the frosting, set a glass bowl over a pot of simmering water, making sure the bowl does not actually touch the water. In the glass bowl, whisk together the sugar and egg whites. Continue whisking until the sugar is dissolved and the mixture is warm and smooth to the touch. Remove the bowl from the sauce pan and either transfer to a standing mixer (with whisk attachment) or use a hand held mixer to beat on high speed about 5 minutes, or until the mixture is cool and thick. Beat in the vanilla, then the peanut butter. Beating on high until fully incorporated. With the mixer still on high add the butter, a few cubes at time, waiting until each addition is incorporated before adding the next. You should have a soft, smooth, creamy frosting. If it starts to look curdled as you add the butter, don’t worry (!! ), just keep beating, it will come back together. Season with a small pinch of salt if needed. Run a knife around the edges of the cake pan, then flip the cake out onto a serving plate. Spread the frosting over the cake. Garnish with chocolate shavings and peanuts, if desired. 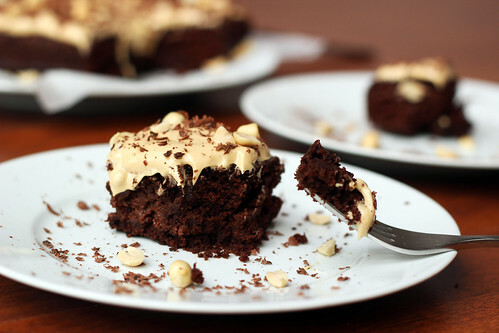 >Love, love, love the combination of peanut butter and chocolate. 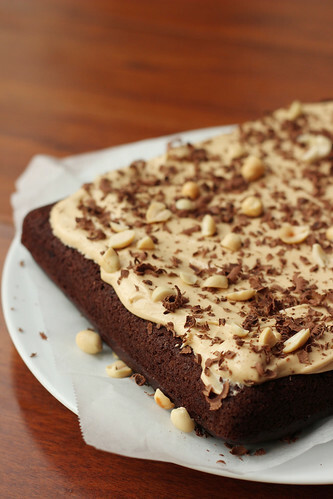 This cake sounds heavenly; rich, fudgy cake topped by a smooth peanut butter frostin. Just give me a big glass of milk and a a fork and I'll enjoy it straight from the pan! >Oh man, my husband will go nuts for this–PB and chocolate is his favorite flavor combination. I'm thinking this is perfect for a Fathers' Day menu! >My husband would love this! He's the only one who eats peanut butter in our house, so the smaller serving size is perfect. >Oh my. Can I come over to your place for dinner sometime? Or actually, just dessert would be okay too!